Hey, Gang—this evening at 6:00 I’ll be at Queen City Café & Gallery (The “Q”) in Titusville Pennsylvania for Regional Writer’s Night. I’ll be reading my book, The Really Awful Musicians! If you live in northwestern Pa, please drop by. Next week on Tuesday March 27 at 6:00 I’ll be at Cranberry Elementary School (also northwestern Pa). Please drop by there, too, if you’re in the neighborhood! Then on Thursday the 29th there’s the SoMIRAC (State of Maryland International Reading Association Council) 40th annual conference. I’ll be a featured author at 8:15 am. I’ll be signing books during an evening with the authors from 7-9:00 pm. Here’s the link for more info & to register. Unlike the original Jack and the Beanstalk where Jack is a thief, in Jack and the Giant Barbecue the Giant stole Jack’s daddy’s recipe book long ago. Jack beards the Giant in his barbecue shack so he can get it back. Here are thumbnails and tight sketches as art director Anahid Hamparian and I worked out how to show the flashback of the Giant stealing the recipe book. I originally painted the final in black & white to make it look flashbacky. Since there is only one flashback in the story it kind of stuck out, so I painted a new one in color. 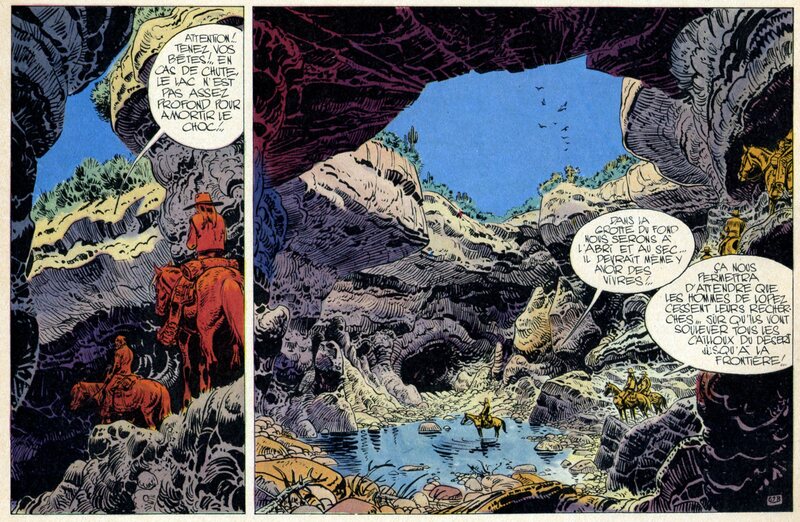 Here are a couple of panels I really like from L’Homme Qui Valait 500000$ (The Man Worth $500,000) drawn by Jean Giraud. This is one of the stories in the Blueberry collection. I encountered the work of French cartoonist Moebius in Heavy Metal magazine when I was in art school. 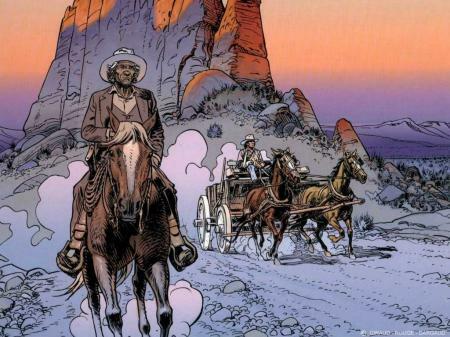 I didn’t realize until later that Moebius was Jean Giraud, who drew the Lieutenant Blueberry comics I loved from high school. A fantastic talent. RIP. A nice review and a mention of Mary Nethery‘s Famous Nini. Thank you, Mrs Goldberg and the Deer Run Elementary School PTO for inviting me out to Dublin, Ohio for a visit on Wednesday! I hope everybody had as much fun as I did. In the great old mediæval fairytale, Jack & the Beanstalk, Jack steals a golden harp from the giant’s castle. Eric Kimmel‘s update, Jack and the Giant Barbecue, sets the action in west Texas and replaces the harp with a jukebox. I have to admit she’s my favorite character in the story. This poor, neglected jukebox doesn’t have a name but Eric wrote some winning country western honky-tonk dialogue for her. She bravely offers to help Jack get his daddy’s recipe book back from the giant who cast her aside. It’s hard not to fall in love with her. I had to design a character who would live up to all that. She had to be a Wurlitzer jukebox—colored lights and tubes to let her shine in the murk of the giant’s barbecue shack. What about eyes, mouth? At first I put 2 eyes on top of the jukebox but no good—it would be hard to make them expressive. One photo I found has a 45 rpm vinyl record centered in the arch of the incandescent tubes. I thought, maybe she could have one big eye? Her mouth would be the coin slot. Jack and the Giant Barbecue is Eric Kimmel’s retelling of Jack and the Beanstalk, set in west Texas. I wanted my images to tell the reader where he is, so the costumes and settings were carefully researched. Color is a powerful tool for telling a story. To make every page look like the American West, I turned to 2 classic painters for guidance: Charles Russell and Frederic Remington. I made small color studies of their paintings before I began developing a palette for Jack and the Giant Barbecue. Notice how both artists accentuate the heat of a prairie scene with warm colors—yellows & oranges—and make the shadows more vivid with cool colors—blues & purples. The color script came next. You can see Russell’s and Remington’s influence in the color, particularly in the outdoor scenes. I carried blues and purples inside the Giant’s barbecue shack to make it dark and unsettling.